West Fargo, N.D. – SpartanNash and its four Family Fare Supermarkets in Fargo and West Fargo, N.D. and Moorhead, Minn. recently donated $19,254.89 to the Sanford Health Roger Maris Cancer Center. The donation was made possible through the generosity of store guests during a pair of fundraising efforts held at the Family Fare locations, as well as additional support from parent company SpartanNash. Store directors from each of the Family Fare Supermarkets presented the $19,254.89 donation to representatives from the Roger Maris Cancer Center on behalf of SpartanNash and its associates and store guests. From left: Dave Staffne, Fargo-25th St. Family Fare assistant store director; Mary Holtz, Fargo-University Dr. Family Fare store director; Randy Henrikson, West Fargo Family Fare store director; Colleen Hardy, Sanford Health Foundation development officer; and Jason Bossert, Moorhead Family Fare store director. On Sept. 9, the Family Fare stores in Fargo, West Fargo and Moorhead hosted their annual 61 for 61 fundraiser cookouts in partnership with 107.9 the Fox and other local businesses. Store guests could purchase a bratwurst, hamburger or hot dog with chips and refreshments at any Family Fare location, with all proceeds supporting the Roger Maris Cancer Center. 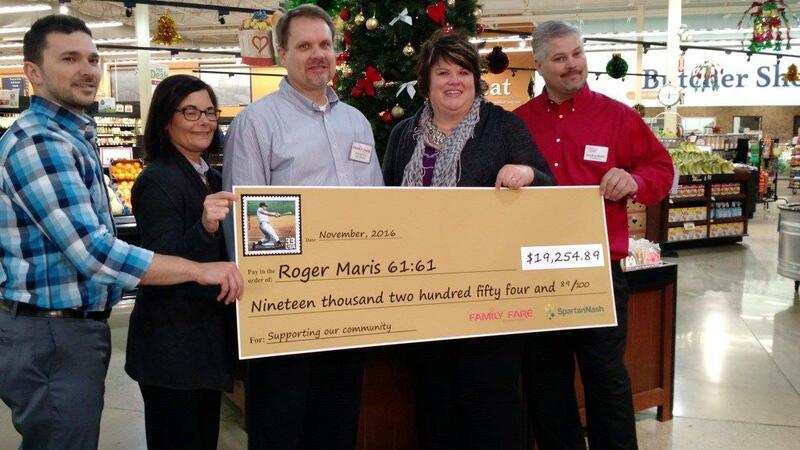 To provide additional monetary support to the 61 for 61 efforts, the four Family Fare locations also held a retail scan program in October, giving store guests an additional opportunity to donate to the Roger Maris Canter Center while at the checkout register. More than $11,000 was raised during the 61 for 61 cookouts and the retail scan program, with SpartanNash adding an $8,000 donation to the total. SpartanNash also underwrote the cost of the retail scan program so that all donations would benefit the Roger Maris Cancer Center, ensuring the fundraising effort would have a significant impact on behalf of those seeking oncology treatments at the cancer center. In the past 13 years, SpartanNash and its Family Fare stores have donated more than $220,000 to the Roger Maris Cancer Center.